How Many Calories in Crab Meat? The calories in crab meat vary slightly, from around 70 to 100 per 3-ounce portion. Crab meat is particularly lean, and over 80 percent of the calories are from protein. Fewer than 20 percent of the overall calories come from fat and even carbohydrates, in some cases, if you consume a type of crab with an edible soft shell. Queen crab tends to be higher in calories than any other type of crab meat. You'll get nearly 100 calories from 3 ounces of steamed queen crab. If you prefer the decadent flavor of Alaska king crab, you'll save a few calories. A 3-ounce of cooked Alaska king crab yields closer to 80 calories. 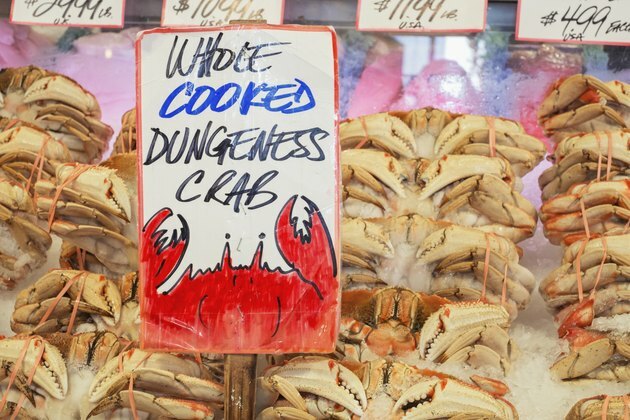 Steamed Dungeness crab is on the higher end, offering almost 95 calories from 3 ounces. If you're really counting calories and trying to limit your intake, opt for blue crab. A 3-ounce serving of either steamed or canned blue crab gives you around 70 calories, 30 percent less than the same amount of queen crab.